A few weeks ago I ordered a bandwidth upgrade (DSOX3BW24) to 200 MHz for my Agilent DSO-X 3014A oscilloscope. As this is a software upgrade the hardware must be already have a bandwidth of at least 200 MHz which is limited in software. The only new hardware which is provided through the upgrade are four new N2863B probes which provide a bandwidth of up to 300 MHz instead of the N2862B which were supplied with my oscilloscope providing up to 150 MHz of bandwidth. 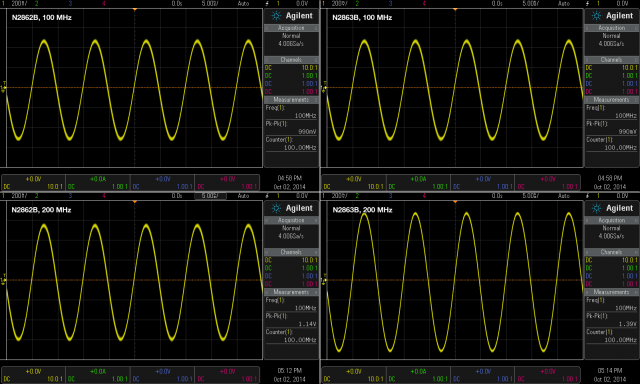 To analyse the performance of the scope before and after the upgrade I measured the peak-to-peak voltage of sine test signal at different frequencies before and after the upgrade using different probes. The sine signal used a fixed effective amplitude of 500 mV and so I expected a peak-to-peak voltage of 1.41 V. To get a 'safe' measurement which should be effected by the oscilloscopes bandwidth I did a measurement at 10 MHz. To test the attenuation of the signal at the new and old bandwidth frequency I also did a measurement at 100 MHz and 200 MHz. To see the performance beyond the bandwidth frequency I did a measurement at 300 MHz (and 500, 600 and 700 MHz after the upgrade). All measurements were done using the supplied N2862B and N2863B probes and an active 1 GHz N2795A probe which should have a high enough bandwidth to not influence the measurements. 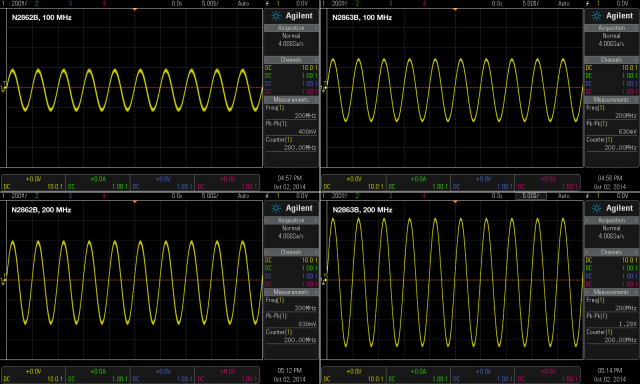 The following images show the measurement of the 100 MHz and 200 MHz sine signal before and after the upgrade with both passive probes. The oscilloscope provides an additional 2.0 ns horizontal scale after the upgrade, but for comparison purposes all measurements have been taken with 5.0 ns. To compare the amplitudes more easily I created an attenuation over frequency plot for all measurement runs. Note that the measurements were only taken at 10, 100, 200 and 300 MHz! 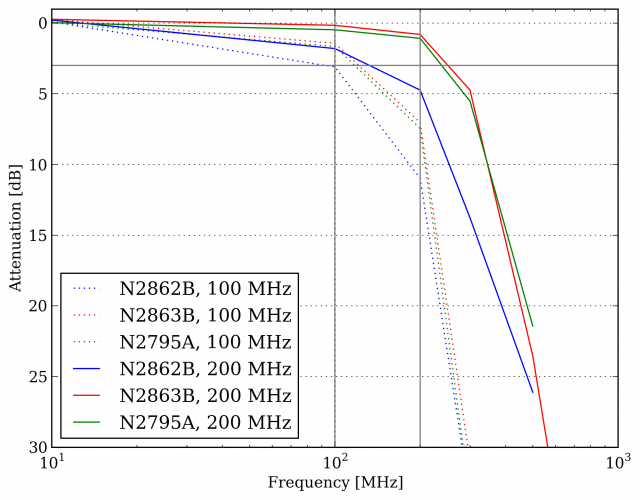 There seems to be no major difference between the active 1 GHz and the passive 300 MHz probes. The 100 MHz bandwidth scope with the 150 MHz probe shows an attenuation of 3 dB at 100 MHz as I would have expected it. The software filter seems to work quite accurate here. Using a better probe decreases the attenuation a little bit. The 200 MHz bandwidth scope shows a much better attenuation at 200 MHz with the 350 MHz probe, so the oscilloscope might have a better bandwidth then the promoted 200 MHz and there is no software filter limiting it exactly. Using the 150 MHz probe of course increases the attenuation and shouldn't be used.